If there is one product I am seriously lacking in my skincare draw, its exfoliators. I always forget to exfoliate and then complain that my skin always looks dull. I have been really impressed with the Yes To products that I have tried so far so I was excited to give the Daily Facial Scrub a go. This is the Yes to Grapefruit Daily Facial Scrub for uneven skin tone. It has 99% natural ingredients and has lemon balm and grapefruit for blissful exfoliation. One of the main reasons why I love Yes to as a brand is that they are cruelty free and this product in-particular is free fromm Petroleum, SLS and parabens. This gentle exfoliator is going to help get rid of dead skin cells to restore the skins natural radiance while leaving the skin soft, smooth and natural hydrated. Due to the Lemon Bam it has been formulated to help calm and repair damaged skin and the Grapefruit is going to naturally even your skin tone. Even though this scrub can be used daily as it is very gentle yet effective on the skin, I still only like to use it a couple of times a week as my skin is a little problematic and I try to keep it as calm as possible. This is one of the finer facial scrubs that I have tried and it doesn't provide any discomfort as you work it into the skin to remove the dead skin cells. Even though it is very gentle on the skin it does a great job at making my skin super soft and removing dead skin cells. One thing I do really like about this scrub and why I will repurchase this scrub is because it doesn't irritate my skin or make my redness any worse. In fact, I haven't really noticed too much redness since I have been using this and my skin has been looking much better overall. 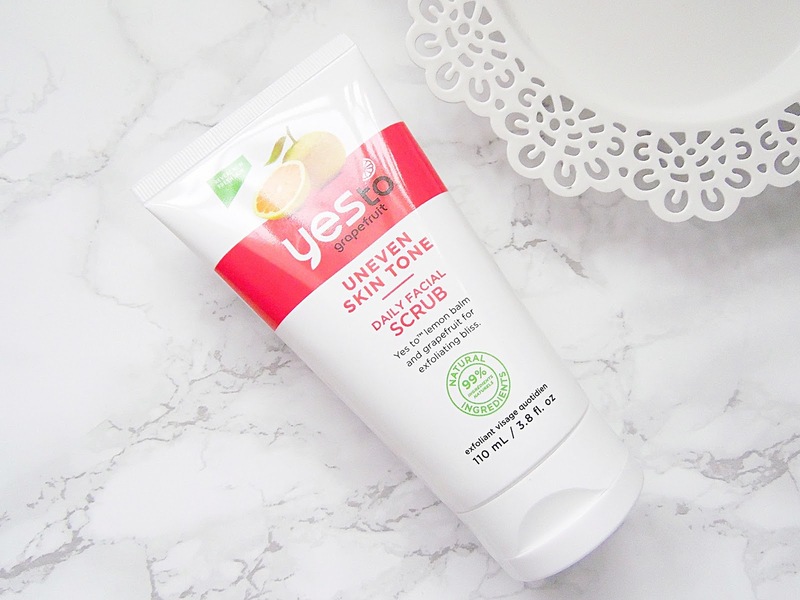 With some scrubs I find them to be a little too harsh on the skin and slightly drying but with this one it adds some extra hydration into my skin, much like the Yes to Coconut Body Scrub which I love as my skin does have some dry patches. Yet again, I have fallen in love with another Yes to product, I can't wait to try more products from this line! The Yes to Grapefuit Daily Facial Scrub retails for £7.99 - HERE.